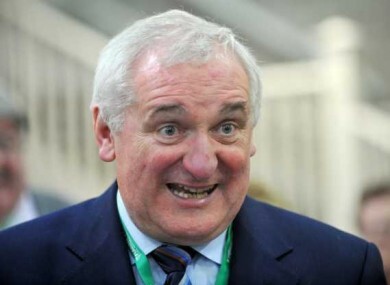 Poll: Should Bertie be forgiven? He’s been getting a lot of flak for his statement to the banking inquiry. FORMER TAOISEACH BERTIE Ahern made his long-awaited return to Leinster House yesterday when he appeared before the banking inquiry. Speaking about his tenure as taoiseach between 1997 and 2008, Ahern admitted he made some mistakes, but said he “did get a lot of things right”. He only wanted what was best for the Irish people, he said, adding that he believed the Irish economy was sound when he stepped down in 2008. Responsibility for the financial crisis really lies at the feet of the Central Bank and financial regulator, he told the inquiry. We’re asking: Should Bertie be forgiven? Email “Poll: Should Bertie be forgiven?”. Feedback on “Poll: Should Bertie be forgiven?”.